“I began my internship at Small Craft Advisory Press (SCAP) three months ago and I have benefited tremendously from my experience thus far. SCAP is a printing press that was founded in 2009 by FSU professor, Denise Bookwalter. SCAP focuses on producing and selling artist books. All of the books SCAP releases are collaborative works born from working with other artists whether it be poets, visual artists, writers, or any other type of creative. SCAP is housed in FSU’s Facility for Arts Research (FAR) and is managed by Elysia Long. Being located in FAR allows us access to equipment like laser cutters, Vandercook letterpress machines, etching presses, polymer plate exposure units, 3D printers, and more. This access allows us to produce pieces which blend print techniques, old and new to push the boundaries of what a book can be. An average day at SCAP, for me, can take many different forms. I could be printing on one of the Vandercooks, preparing photopolymer plates for printing, binding books using a variety of methods, preparing paper, scanning pieces for documentation, photographing finished pieces, dying thread, testing different glues, building cases for the books, and the list goes on. 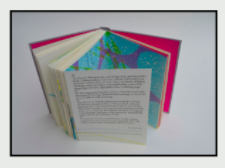 It takes a great deal of work and time to produce artist books and it requires many different processes along the way that go beyond printing the pages themselves. Another important aspect of this form of art is that it deals in multiples. At the binding stage, for example, I could be binding up to 70 editions of just one book. Working in numbers like that make each step into a much larger production. For some, that may seem daunting and even boring but to me, working in multiples is meditative and gives me a sense of satisfaction. I love knowing that I’ve accomplished something that required care and patience to help produce a series of works that many people will be able enjoy and own.